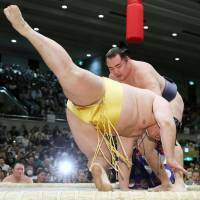 OSAKA - Yokozuna Kakuryu survived a scare Monday to remain undefeated on the second day of the 15-day Spring Grand Sumo Tournament. January’s champion Tochinoshin (1-1) suffered his first defeat of the tournament to top-ranked maegashira Tamawashi (2-0). After a thunderous clash, the recently promoted sekiwake was pushed down by Tamawashi in a flurry of pushes and slaps. Ozeki Takayasu (0-2) was no match for komusubi Ichinojo (2-0), and was almost immediately pulled down by the 215-kg Mongolian for his second straight defeat.